The King's Academy Middle School strives to provide bright young minds with a space in which they feel comfortable expressing themselves; one that cultivates their curiosity through active and interactive forms of learning, personalized instruction and advising, and the development of strong habits of study and character. The Middle School focuses on character development, debate and self-expression, collaborative teamwork, understanding and evaluating multiple perspectives, and finally, play. The academic program is unlike any other in Jordan, with interactive, hands-on classes that challenge the mind and stimulate the imagination. The Middle School has replaced the traditional grading system with a student-centered approach that revolves around three important skills: reflection and meta-cognition, reading and understanding feedback, and goal setting. Students engage in writing their own report cards in reflections on their own learning, guided by evidence and narrative feedback from their teachers. They then set goals for themselves to highlight areas of growth. The Middle School engages and deepens student learning in a way that motivates them to take control of their own educational journey and develop a love of learning that lasts a lifetime. King’s believes that arts and music programs inspire in students a desire to learn, and thus are just as important to education as math and science. The Middle School’s vibrant music and arts programs reflect this, offering students plenty of outlets to express their individuality and creativity through art, theater, dance, music, orchestra and more. 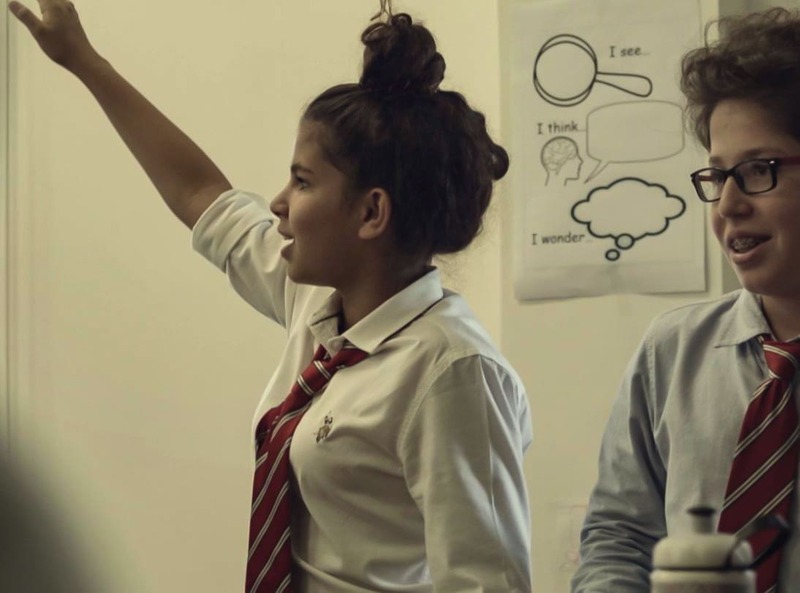 The Middle School is forging a revolutionary way of teaching and learning English and Arabic. The curriculum is based on award-winning educator Nancie Atwell’s approach to teaching children to read and write that helps kids become skilled, passionate, habitual and critical readers. In the Middle School, traditional classrooms have been replaced with comfortable chairs, reading zones, writing workshops and classroom libraries filled with hundreds of titles for students to choose from. The reading zone aims to create readers for a lifetime by allowing students to actually enjoy what they are reading and by taking time out of each day for them to sit quietly in class and just read. Writing workshops give students regular chunks of time to write and the possibility to choose their own topics to write about. Teachers keep close tabs on their work and provide one-on-one feedback during the writing process, in addition to mini-lessons that teach the whole class the mechanics of writing. Alongside an innovative curriculum, the Middle School has replaced traditional exams and grading with a completely revolutionary system. Minimesters take place for three to four days at the end of each term, replacing traditional end-of-term exams and providing students with an opportunity to demonstrate what they’ve learned in the classroom throughout the term through research, projects and presentations. Minimesters encompass projects and activities from all the disciplines taught to the students including humanities, science, math and English. Learning is important, but kids need time at school to play too. The benefits of play are many; it helps cultivate creativity and imagination, and develop important social, emotional and cognitive skills. Every day, Free Play periods give students the opportunity to have fun with their friends outside of the classroom, play sports or just relax. The Middle School believes in incorporating elements of play into the classroom too. By incorporating fun and interactive exercises in class, and allowing students to makes choices about what they want to learn, they develop their creativity and imagination, and enjoy the process of learning. At King’s Academy we believe in building a community, not just filling a classroom. The Middle School motto is Cherish One Another. Whether student or teacher, we strive to always be kind, to listen, to look out for each other and to support and uplift one another. Ask any Middle School teacher and they will tell you their door is always open. At the end of the day, we are family. Some of the ways that we strengthen our bond is through close-knit advisory groups, daily sit-down lunches, weekly class get-togethers and regular trips and extracurricular activities. Each day, during P.E. class, Workshop or Engage, Middle School students pursue athletic, artistic or intellectual activities that interest them. Examples of Middle School Workshop and Engage activities include: coding, design thinking, entrepreneurship studies, debate, Model United Nations (MUN), robotics, Jordan Model Parliament, journalism, theater improv, community service, dance, art, theater, publications and athletics. P.E. includes cross fit for teens, basketball, soccer, volleyball, swimming, cross country, badminton, and frisbee gold.